I was given a chance to review the following DVD that is due out January 7th, 2014. The DVD contains a double feature of stage plays "In Sickness and in Health" and "To Love and To Cherish" both directed by Roger Melvin. The films were original shown on television in 2012. The DVD will retail for 14.99 and can be found at Amazon or your local DVD store. In Sickness and In Health features veteran actors Chico Benymon (UPN's Half & Half) and Jennifer Freeman (ABC's My Wife and Kids) as a couple (Norman and Faith) that are months away from getting married. However, Faith has not told Norman about her medical condition that had claimed her mother's life at the age of 40. She fears that he will leave her as her prior boyfriend did upon finding out about her sickle cell disease. 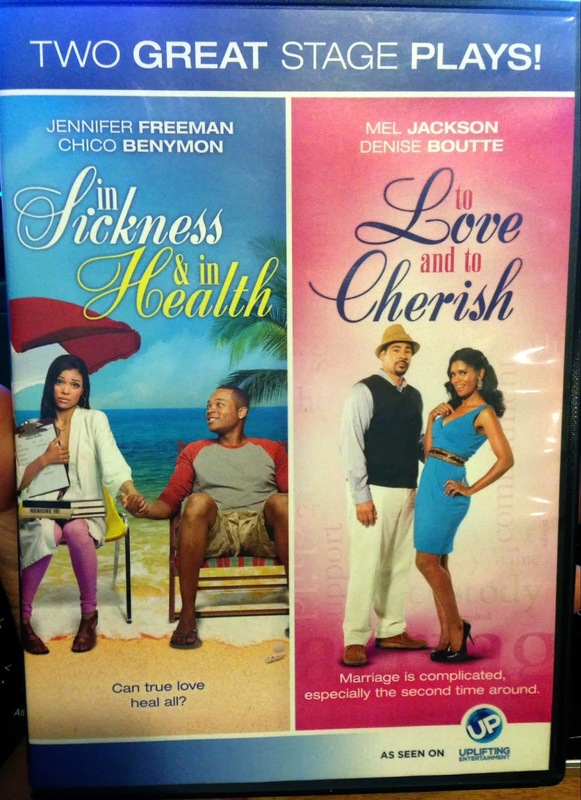 To Love and To Cherish also features a veteran black cast including Mel Jackson (Soul Food) and Denise Boutte (TBS's Meet the Browns). In this film, Mel and Denise are a married couple, each with teenage children from a prior marriage. This film explores the challenges of two families becoming one when there are different obstacles constantly challenging the couple. Despite the fact that both delivers different messages, the underlying feel of the two movies bears the hallmark of Director Melvin on the lessons it teaches about family and love. While I thought the plot for In Sickness and In Health was more well put together as far as plot, it was the actors of To Love and To Cherish especially Mel Jackson that did a phenomenal job in his role. Both films brings me back to the days of say the Cosby Show or Different Strokes, with the comedy and family elements to them. What was a bit disappointing but expected from such low budget productions are the sets used. While adequate for a stage play, certain things such as a door that leads to the outside not having any type of locks is a bit mind bending to a New Yorker like myself. Also perhaps more frequent in stage plays than in movies is having a character break out in song which each of the movie has. Both singers, Darlene McCoy (In Sickness and In Health) and Shirley Murdock (To Love and To Cherish) have amazing voices and really bring it in their solos. It just seemed a little out of place with the film to have them break out in song. I would recommend the DVD as both films were enjoyable. Would I pay to see it if it was in the theaters? Probably not. But of course, they are not that type of films. Both have a runtime of approximately 88 minutes and is unrated. I would say that both are appropriate for children age seven and up. If you would like a nice pick me up movies and pick up this DVD to get two for the price of one. Rating: 3.0 Stars out of 5.0 Stars.